Seve Ballesteros is a Spanish professional golfer and former World No. 1. 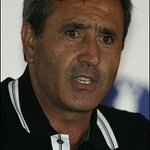 Seve Ballesteros has passed away, but we remember his charity work. Google trends for "Seve Ballesteros"
We don't have any videos related to Seve Ballesteros.